A statue of Karen martyr Saw Ba U Gyi received a tumultuous welcome from local residents in Naung Tal Village under the Karen National Union (KNU)-controlled area in the Mon State’s Kyaikmaraw Township on February 3. The statue is scheduled for installation at the KNU’s Win Yay Township office in Win Yaw area (Kyain-seikgyi Township) of the Karen State on the upcoming 70th anniversary of the Karen National Day, which falls on February 11. The statue has found a temporary home in Mekkatha Village of Win Yaw area now. Saw Ba U Gyi’s statue was carried from Yangon on the night of February 2 and it arrived at the entrance of Naung Tae Village on the morning of February 3. Local Karen National Union/Karen National Liberation Army (KNU/KNLA) troops and local residents tumultuously welcome the statue while wearing traditional Kayin costumes and performing the don dance. Local Karen people from Myoe Haung, Kha Lel Lay, Kha Lel Ta Khun Taing, Taung Dee, Kyon Khon, and Hpar Pya villages along Hpa Yar Ngar Su – Ah Nan Kwin Road welcomed the statue at the entrance of their villages and accompanied the procession while the statue was being transported to the KNU’s Win Yay Township office. After the statue arrived at the KNU’s Win Yay Township office at 11 am, local Tatmadaw troops led by Ah Nan Kwin Tactical Operation Command’s commander Col Tun Tun San came to object to the statue. Although officials from both sides negotiated for an hour, they were unable to reach an agreement, according the KNU’s Win Yay Township’s chair P’doh Saw Maung Shwe. “Ah Nan Kwin Tactical Operation Command’s commander arrived and didn’t allow us to erect the statue at Win Yay Township office. He objected to it. We negotiated with the district chairman but it didn’t go well. [The statue] was objected once in Payathonzu. It’s too much that we are not allowed to erect a statue in our own area,” he told Karen News. The KNU Division 6’s chair P’doh Saw Shwe Maung and the 16th battalion commander negotiated for an hour with Col Tun Tun San, commander of Ah Nan Kwin Tactical Operation Command, regarding the statue issue but the KNU was not allowed to erect it at Win Yay Township office. The Tatmadaw’s side told the KNU to erect the statue in Mekkatha Village, which is under its control, and an emergency meeting of the Joint Monitoring Committee (JMC) will be held to decide on erecting the statue at Win Yay Township office. “One must bravely demand what he wants. He won’t get anything if he sits at the JMC without saying anything. Can’t they do anything when the other side obstructed? We signed the NCA and we have equal rights. What’s the point if one does not say anything after signing the agreement? The grass roots are suffering and the superiors only say ‘yes yes’ when other people [give the order],” Nan Myint Tin from the Karen State JMC told Karen News on February 4. 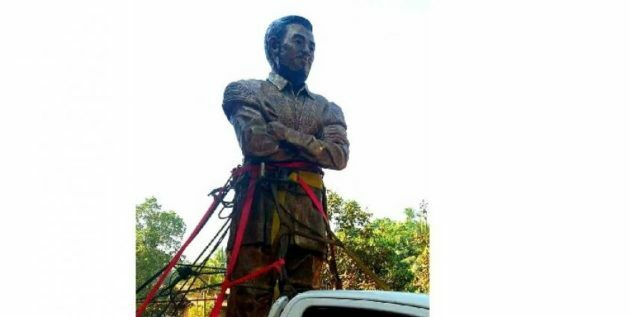 The KNU decided to erect Saw Ba U Gyi’s statue in its Win Yay Township office on the Karen National Day, which falls on February 11, after the Tatmadaw objected to the plan to erect it at Payathonzu on the 80th Karen New Year last December.